When you visit Brenda Carr-Vellino’s office, your eyes are drawn to her eclectic collection of literary works, ranging from Chinua Achebe to Dionne Brand. 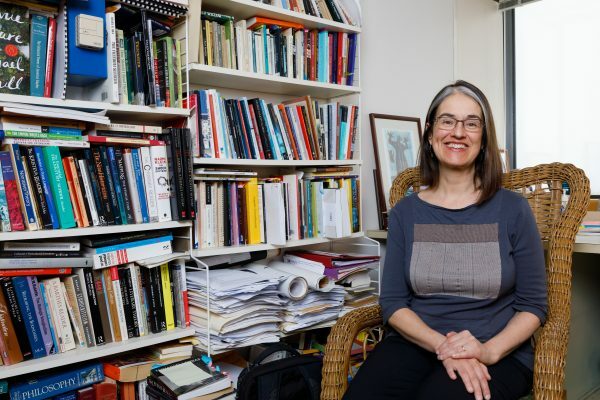 Her stacked shelves are reflective of her 27 years as a faculty member in the Department of English at Carleton, teaching contemporary literature, poetry, drama, and Indigenous literature. Her passion for teaching moves well beyond the pages, as she takes pride in being student-focused and caring about both their personal and intellectual well-being. When asked of her greatest accomplishment, Brenda is motivated by being a mom and is grateful for the way that her life has been enriched by growing alongside her two children. She brings this same level of care to her classroom, as she strives to offer support to students and community members. “I love my engagements with students, as it really brings a lot of vitality to my life”, said Brenda. Brenda believes in paying it forward, as she was the recipient of scholarships herself when she was a student. This encouraged her to give back by donating to both the Bimaadiziwin Fund, and the Faculty of Arts and Social Sciences Endowment, to help enhance student’s learning opportunities by providing financial assistance and other important academic resources. “It is a more personal choice for me to support the Bimaadiziwin Fund, as I always have Indigenous students in my classes, and often they are first-generation in university. I come to know their personal stories and how hard they work to be here, and I want to offer my support in any way that I can”. Brenda expressed that she feels positive about being part of the Carleton community, as it cultivates a culture of philanthropy. She gravitated towards giving through FutureFunder, as it provides the opportunity to target your gift towards a meaningful initiative that resonates with individuals on a personal level. “It gives that personal connection, and I love knowing that my donation goes directly towards a project that I am passionate about”. As a community volunteer, avid gardener, and mentor, Brenda undeniably believes in the power of positive well-being. This sentiment permeates through her relationships with students and fellow colleagues, as she strives to make an impact both in and outside of the classroom. Whether she is at home alongside her family, or meeting with students at her office in Dunton Tower, it is clear that Brenda draws inspiration from our next generation of leaders. Do you have a personal motto or saying? If you could meet anyone who inspires you, who would it be? There’s a poet who I have been working on recently whose work I really love, her name is Rita Wong. She’s a west coast poet and she raises awareness about how embedded we are in water cycles, and what happens when water in our environment becomes contaminated. She takes a lot of her cues from Indigenous water protectors, and she’s really showing ways to be respectful and responsible towards water. What profession other your own would you like to attempt? A medical doctor-I feel that I would have been a really great family doctor. I’m really interested in health and well-being. To show how much this has been in the back of my mind, I have researched medical schools in recent years. Where is your favourite spot on campus? What inspires you to ‘do good’ by supporting the Carleton community? Being committed to caring about the well-being of students.